Maestri DF-54. 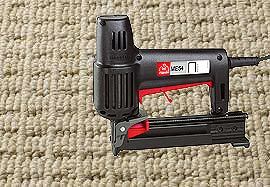 20 GA, 3/16" narrow crown professional electric tacker for carpeting, flooring and subflooring. 12 foot power cord. Similar to Fasco F1B 54DF-18 air tacker. Uses 54 series staples (3/8" - 9/16") - Fasco ED-54, Duofast 54, BeA 91, Spotnails P54. Divergent staples available. Professional electric stapler with high resistance body in reinforced fiberglass. Safe interlocking trigger to prevent accidental firing. Maximum power and high fastening speed. Great for Professionals and Do-It-Yourselfers.